St. Louis  July 18, 2009 - “The Gospel of Life” was the theme of a day of recollection conducted by Bishop Robert Hermann, St. Louis auxiliary bishop, on Saturday, July 18, 2009, at the Cardinal Rigali Center. More than 80 attended the event sponsored by Women for Faith and Family, a St. Louis based organization of Catholic women, as part of its twenty-fifth anniversary observance. 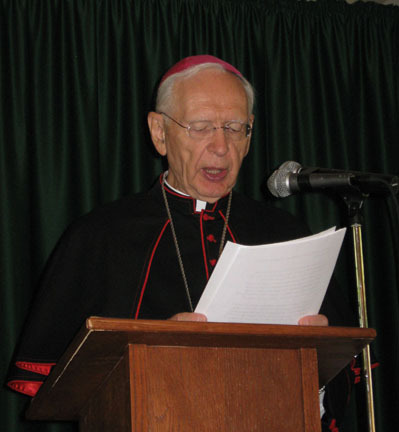 Bishop Hermann gave three in-depth reflections on Pope John Paul II’s key encyclical, Evangelium Vitae (The Gospel of Life). This 1995 encyclical is a profound teaching on the fundamental Christian truth that all human life is linked to God and thus is sacred from its very beginning. Bishop Hermann guided the group through the encyclical’s four chapters. He stressed the responsibility of every person to build a “culture of life”, and the obligation of all Christians to be able communicate the truth about human life to others by our actions as well as by words  and to be willing to suffer for this truth. The day’s events also included a Votive Mass of the Blessed Virgin Mary and choral recitation of morning and evening prayer (Lauds and Vespers) held in the beautiful gothic-style chapel of St. Vincent de Paul in the Cardinal Rigali Center. Father Samuel Weber, OSB, director of the St. Louis archdiocesan Institute for Sacred Music, composed chants for the English texts for the Divine Office, and led the group in singing. The chapel is ideally suited for choral recitation of the Divine Office, as it was originally built for Kenrick Seminary with antiphonal seating, or choir stalls, common to religious or monastic churches and like the chancel area of gothic cathedrals. In addition to Bishop Hermann and Father Weber, five priests heard confessions in the afternoon: Msgr. Timothy Cronin, Msgr. David Ratermann, Msgr. Thomas Woracek, Fr. Harry Voelker and Fr. Donald Henke. During the day of recollection, participants also recited the Rosary together, and began the Novena for the Protection of the Unborn. Bishop Hermann’s talks were recorded, and are available as a set of 3 CDs. The set may be purchased ($15 + $4.00 shipping) from St. Joseph Radio, 3895 Cambridge Crossing Drive, St. Charles, MO 63304, or phone 636-244-0089. A study guide for Evangelium Vitae prepared as an aid to individuals or groups in understanding this important papal encyclical is available from Women for Faith & Family. For information about Women for Faith & Family, contact 314 863-8385; or visit the WFF web site: http://www.wf-f.org - PO Box 300411, St. Louis, MO 63130.